There are many different nutrients that play vital roles within the body, which means that when the body becomes deficient in those nutrients, symptoms of illness begin to appear. Magnesium is one of the most essential macro-minerals needed by the body, yet most people don’t receive enough magnesium on a regular basis. Magnesium is one of the seven essential minerals that the body needs in relatively large amounts each day. It is absolutely essential because it supports more than 300 enzymatic reactions needed to function in the body, from metabolism of food and transmission of nerve impulses to synthesis of fatty acids and proteins. 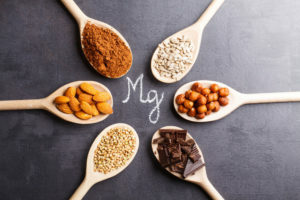 All of this means that magnesium makes it possible for the body to produce and use energy, contract and relax muscles, and control vital body functions. True health and wellness cannot be achieved without magnesium! How Much Magnesium Should You Be Getting Each Day? The National Institutes of Health recommend that young children aged 1-3 years old get 80 milligrams of magnesium a day, and the number rises up to 240 milligrams for the 9-13 age range. Adult females need 310 milligrams daily. Adult males need more magnesium than anybody else, with an RDA of 420 milligrams. Seeds, almonds, spinach, beans, oatmeal, peanut butter, cow’s milk, edamame, and bananas are all great sources of magnesium. Magnesium deficiency is a widespread health problem and could even be the root cause of your health conditions. It’s a sneaky problem since so many other issues cause similar symptoms. This is why it’s so important to seek the help of a highly qualified holistic doctor to determine if you need to take more magnesium on a regular basis. Call (813) 935-2273 to make an appointment at Mind Body Spirit Care in Tampa, Florida. As an Integrative Medical Center, Mind Body Spirit Care is committed to helping patients achieve not just an absence of disease, but truly enriched optimal health.